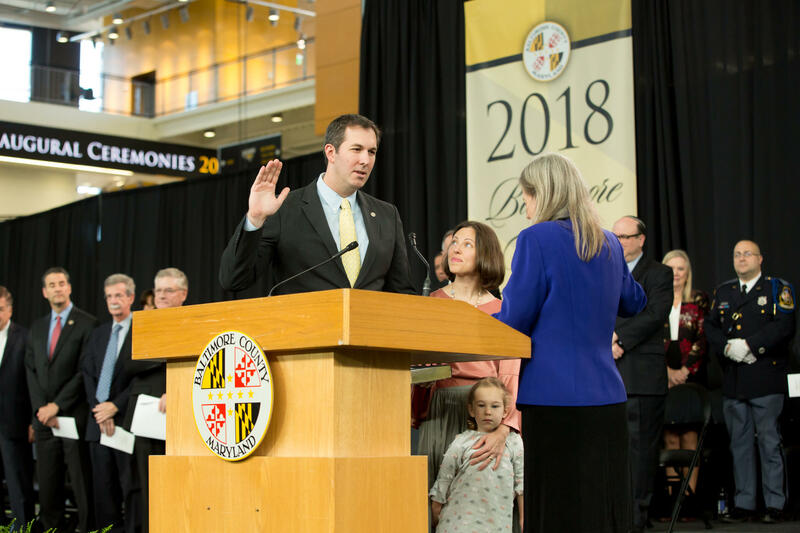 Johnny Olszewski Jr. was sworn into office Monday as Baltimore County Executive. Now he’s faced with the possibility he may need to raise taxes, cut the county budget or both. This comes as Olszewski is promising a closer working relationship with the council. Democratic Councilman Tom Quirk said a tax increase needs to happen in 2019. That’s a reference to former county executive Kevin Kamenetz’s $1.3 billion plan to build and renovate schools. Quirk said it needed to be done, and now it’s time to pay for it. After his inaugural Monday, Olszewski signed an executive order, establishing a seven-member blue ribbon commission to study the budget. Olszewski said he will pick four of the members, the county council will get to pick the other three. Kamenetz was a Democrat and the Republicans on the county council often groused about the lack of communication and transparency coming from the county executive. Olszewski promises that will change, and has already met individually with each council member. Republican Councilman Todd Crandell is encouraged. Republican Councilman Wade Kach represents the conservative, rural 3rd district, a district he says has been overlooked for years by the Democrats running the show in Towson. But soon, when it comes to the county budget and taxes, the relationship between the county executive and county council will be tested. Olszewski will send his first budget proposal to the council in April. Neither Kach nor Crandell is embracing the idea of raising taxes. During the campaign, Olszewski said raising taxes would be a last resort. In an interview with WYPR before his swearing in, Olszewski promised to be transparent with taxpayers, when it comes to how money is being raised and spent. Another reason for transparency is to get taxpayers involved and to buy in, if the county needs to raise taxes or cut its budget, or both. County Council Chairman Julian Jones, a Democrat, said most county residents he talks to believe they get a good deal for their tax dollars. Quirk, who chairs the council’s spending and affordability committee, said if the county does not take action to fix the budget in 2019, a downgrade of its Triple-A bond rating is a sure bet. Quirk said, “If we get downgraded because we fail to act, it means every single dollar that we borrow, we still need to borrow the same dollars but now we pay a higher interest rate. And so from a county taxpayer’s standpoint, now government’s cost us more money to do the same exact thing." In his inaugural speech, Olszewski promised to be honest with the county. He said the challenges ahead are significant and real, but they can be solved. Olszewski’s budget commission must make its interim recommendations by February 15. Baltimore County Executive Don Mohler will step aside on Monday, December 3, to make way for county executive-elect Johnny Olszewski Junior. WYPR reporter John Lee talked with Morning Edition host Nathan Sterner about his interview with Mohler, in which they discussed what is perhaps the biggest challenge that awaits Olszewski as he takes office.